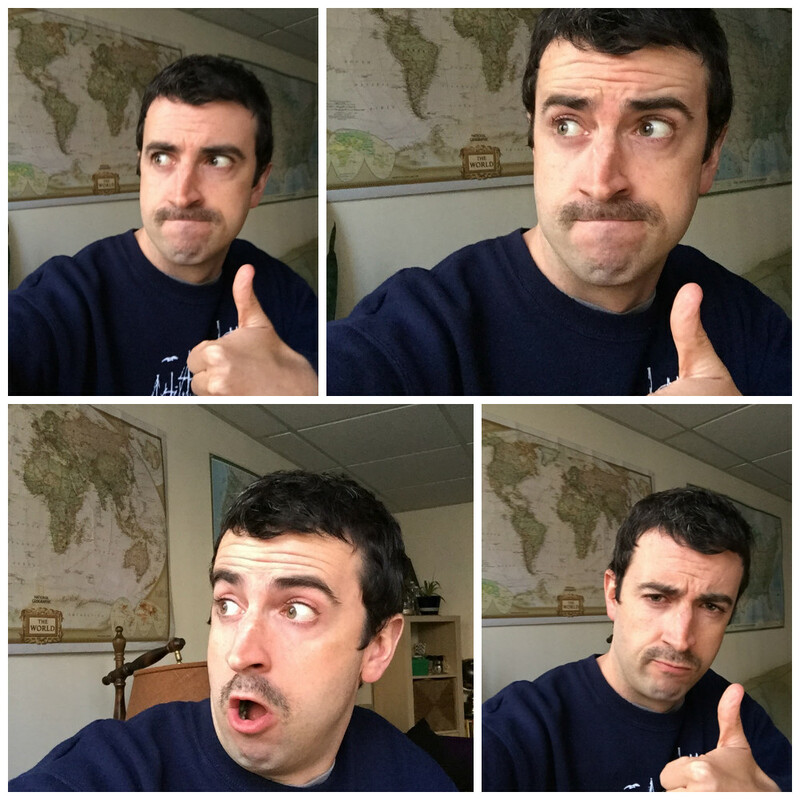 This month, I’m participating in a fundraising event called Movember. Perhaps you’ve heard of it? During this time, I will grow a mustache from scratch, in exchange for piles and piles of cold, hard cash donated by friends, loved ones, family members, strangers, postal workers, certified accountants, and of course, circus performers. You should not feel obliged to donate your hard-earned money simply because I’m growing a mustache. But still, you should consider it. Think of it as a Kickstarter campaign for my personal upper-lip hair. The goal of which, is to raise money and awareness for the men’s health movement—an important, and often overlooked area. So on to the nitty-gritty details. I will be focusing on raising awareness about physical inactivity and poor mental health, both of which I’ve had plenty of experience with throughout my thirty plus years of existence. Let’s face it, most of us probably have at one time or another, and there’s no shame in that. Men don’t like to discuss emotions and feelings. Why do Men Love Couches so Much? My couch is small, pale-colored, and nimble. Nevertheless, I find it to be a wonderful place. It comforts me when I’m tired but not quite ready for bed. And it supports my body in ideal positions while I mindlessly succumb to the viewing pleasure of Netflix and broadcast television shows. Both sitcoms and dramas. What could be better? This is our tiny, green couch. I can eat on it. I can spill things on the cushions and flip them over. I can express joy at finding loose change. I can drink beer on it. I can delay things I have to do while pondering on it. So really, it’s no surprise that men can easily fall victim to physical inactivity. We work our butts off during the week or nights or weekends, and when we’re not working, the couch can be a good friend. But, that just doesn’t cut it. Sometimes, you have to tell your friend you can’t hang out today. You have to get up, do some jumping jacks, take a walk around the neighborhood, and perform some light stretching. And you have to do it every single day! Why Don’t Men Like Discussing Emotions and Feelings? Poor mental health is a very broad area, and many conditions fall into this category. Personally, I used to think that feelings were icky and emotions are stupid, that thoughts are dumb, and that the best mental health strategy is to suppress our internal lives as far down into our bodies as possible. Lo and behold, it turns out that is exactly the opposite of healthy. Poor mental health can lead to poor physical health, which is no fun at all. Who wants to be alone with their brain when it’s going haywire, making fun of you, and convincing you how much better everyone else is at life? To help combat this thing we call “being alive,” I enjoy meditation. I can’t do it for very long. I think thoughts almost the entire time I’m doing it. And, I inevitably almost always have to pause to itch or blow my nose several times during the attempt to sit still. Of course, mental health can be much more complicated than feeling stressed out or having negative thoughts, which is why we have physicians, therapists, and all sorts of resources to support us if need be. I focus on the breath by paying attention to my nose. I let my belly expand. I forget what I’m doing and get lost in a daydream. I sit cross-legged on my cushion or my couch, with good posture. I remind myself to stop slouching. I pick my nose and then don’t know where to put it. I remind myself to pay attention to my breath again. I sing car insurance jingles in my head. I pay attention to where my tension is, usually it’s in my head. I roll my shoulders back. I keep my hands folded together in my lap. I get bored and start watching TV. This is a meditation cushion. There you have it. Both insight and wisdom. It’s not for everyone, but it helps me maintain some decent mental health. I can only assume that growing a mustache will greatly enhance my meditation abilities. Let me be frank, I have never grown a mustache. I’ve had a beard many times, but never the guts to grow a straight mustachio. My generation didn’t grow up in an era where this type of grooming was considered normal. Do I use mustache wax? If so, how much and how frequently? Should I comb the mustache? What type of conditioner do I use? Should it be twirled on a daily basis or only when in deep thought? If someone punches my mustache do I feel pain? What sort of snacks are best saved-for-later in mustaches? Do I need a license to stache? Will I spontaneously combust if I accidentally wear a plaid shirt and start chopping firewood? Is Tom Selleck always raising money for men’s health? Let’s face it, if you’ve read this much about me and my future mustache, you must be an incredible human being, and I applaud you. There is absolutely no need whatsoever to donate; you are already one-hundred percent awesome, just for being you. However, if you so choose to throw a little pocket change my way you can do it at http://mobro.co/matthobin. All donations are very much appreciated and I would certainly be willing to provide you with a signed photograph of me and my mustache once it has reached full growth potential. When it comes to staying active, I don’t think you have to run a million miles or lift a billion pounds. But, you should try and move your body ever-so-often. Couches are amazing, trust me, I know. But inactivity takes away from the best part of life—being human. And a big part of being human is moving around. Plus, a little hustle and some light sweating helps us stay sane. And so this month I’m growing a mustache. I even started a few days early because I was so excited to begin this quest. I’ve never done it before. But things are different now. I have a stable job. I just bought a new, used car. I’m getting married soon. I have a good collection of sweatpants. There has never been a better time to grow a mustache. Long live the stache. Sign up with your email address to receive awesomeness.